TurboCAD Mac Pro delivers unparalleled value and productivity in a professional 2D/3D CAD package with fully integrated 2D drafting tools, 3D surface and ACIS********* solid modeling tools, assembly tools, advanced architectural tools, powerful LightWorks photorealistic rendering, 3D printing features, and extensive file support. 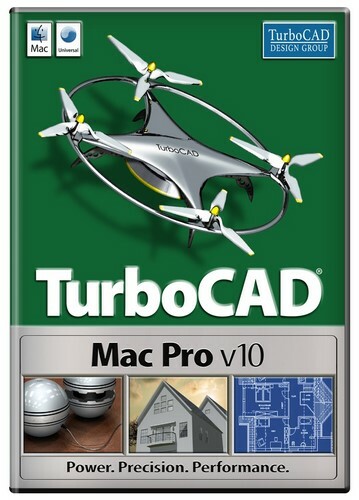 TurboCAD********* Mac Pro delivers unparalleled value and productivity in a professional 2D/3D CAD package. Fully integrated 2D drafting tools, 3D surface and ACIS********* solid modeling tools, assembly tools, advanced architectural tools, and powerful LightWorks photorealistic rendering are accompanied by thousands of symbols, materials, decals, and more. When it's time to present your ideas, TurboCAD Mac Pro delivers stunning photorealistic renderings. Apply materials and decals. Set lighting, shadowing, reflectance, roughness and environmental effects. Then render with the powerful LightWorks Photorealistic Rendering Engine. Sketch rendering options are also available for a hand-drawn look, appropriate in the early s***es of conceptual design. Easily import existing designs from popular CAD and graphic design file formats, including AutoCAD********* .DWG. Just as easily, save designs from TurboCAD to other CAD formats, or choose a popular desktop publishing formats such as EPS TIFF, CGM and more, to create brochures or other marketing materials. Even print design to your specifications with options for better control of how the printed ******** will look. Macintosh********* OS X 10.8 (Mountain Lion), 10.9 (Mavericks), 10.10 (Yosemite) , 10.11(El Capitan), and 10.12 (Sierra) Intel********* Mac*********, 8 GB of hard disk space, 4 GB RAM or greater, Mouse Pointing Device (wheel button recommended). Compatibility not guaranteed for later operating systems.